"With gratitude that the Word becomes flesh." Image: Andrei Rublev, public domain scan. "Wisdom Calls," Kathryn M. Matthews, Sermon Seeds, UCC, 2016. "The Spirit as the Emissary of Truth," D Mark Davis, Left Behind and Loving It, 2013. Process and Faith Lectionary Commentary, Trinity Sunday, Ignacio Castuera, "...bringing process-relational thought to people of faith." Pulpit Fiction, podcast. (Memorial Day commentary, Trinity Commentary) Reflections of lectionary text, pop culture, current events, etc. Robb Mc Coy and Eric Fistler, 2013. The Lectionary Lab, Trinity Sunday, the Rev'ds Dr. John Fairless and Delmer Chilton (aka "Two Bubbas and a Bible"), 2013. Lectionary Lab Live podcast. Girardian Reflections on the Lectionary, Trinity, by Paul Nuechterlein & Friends. Jesus Now, Trinity Sunday. Lectionary, study and worship resources from Faith Futures Jesus Then & Now. "Don't Mention the Trinity!" David Lose, ...in the Meantime, 2016. "Trinity Talk," Karoline Lewis, Dear Working Preacher, 2016. "Walter Brueggemann on Wisdom," Walter Brueggeman,ON Scripture, 2016. "Inseparable Operations," John W. Martens, America: The National Catholic Reporter, 2016. "The Politics of Wisdom and Folly," Alastair Roberts, Political Theology Today, 2016. Trinity Sunday, commentary and discussion, RevGalBlogPals, 2016. "Deeper Than the Darkness," Edwina Gateley, Journey with Jesus, 2016. "Faith in the Trinity," Manoj Matthew Zacharia, Modern Metanoia, 2016. "A Deperate Need for Wisdom," John C. Holbert, The Paripatetic Preacher, 2016. "Mary, the Trinity's Plus One," Nancy Rockwell, The Bite in the Apple, 2013. "Wisdom, Spirit, Truth: The Lectionary for Trinity Sunday," Eric Smith, LECTIO, 2016. "In This We Boast: In Christ We Hope," Sharron R. Blezard, Stewardship of Life, 2016. "The Things We Cannot Bear," Melissa Bane Sevier, 2016. "Communion of Subjects," Suzanne Guthrie, At the Edge of the Enclosure, 2016. A Trinitarian Declaration of Truth, Bob Cornwall, Ponderings on a Faith Journey, 2016. "Holy Wisdom," Lynn Miller, celebrating our creative and living God by generating art and architecture resources for congregations and individuals. Art and Faith Matters facebook page contains additional resources. "Wisdom in Triplicate," Glenn Monson, Law & Gospel Everywhere, 2016. "Thinking about the Spirit," Weimar Wanderings, 2016. "Slightly Less than Divine?" Larry Patten, 2016. "Wisdom's Three-in-One Dance," Sermon-Stories.com, 2016. "Trinity: 3 X 1 = 1," Journey to Penuel, 2016. "Suffering. Together." Janet H. Hunt, Dancing with the Word, 2016. "Paul," "Hope," "Wisdom," sermon discussion from Frederick Buechner, Frederick Buechner Blog. "Hope in the Meantime," David Lose, Working Preacher, 2013. "The Power of Three," Alyce M. McKenzie, Edgy Exegesis, 2013. "The Delight of Wisdom," John C. Holbert, Opening the Old Testament, 2013. "Lo Cotidiano - The Daily Thing," Pentecost, guest essay by Edwina Gateley. Daniel B. Clendenin, The Journey with Jesus: Notes to Myself, Journey with Jesus Foundation, 2013. 2010. 2007. "Love in the Abyss," Todd Weir, Bloomingcactus, 2013. "Ease of Mystery," Michael Coffey, 2013. "The Politics of the Trinity," Amy Allen, Political Theology, 2013. "In Good Company: Peace, Love & Hope," Sharron Blezard, Stewardship of Life, 2013. "Lady Liberty, Lady Justice and Lady Wisdom," Beth Scibienski, 2013. "Seeing and Eating Truly," Thomas Beam, 2013. "Masaccio's Trinity," Steve Godfrey, Church in the World, 2013. "Do You Believe in Something Greater than You?" Bob Stuhlman, Stories from a Priestly Life, 2013. "Like Flame," Anne Howard, A Word in Time, Beatitudes Society, 2013. "Overcoming Epistemology," Mark Ryan, Ekklesia Project, 2013. "Communion of Subjects," Suzanne Guthrie, Soulwork toward Sunday: At the Edge of the Enclosure, 2013. "Dancing with God on Trinity Sunday," Robert Cornwall, Ponderings on a Faith Journey, 2013. Doctrine of the Trinity Reading Room, Tyndale College and Seminary. Truth That Catches Us, Dr. Janet H. Hunt, Dancing with the Word, 2013. "Magic Moment," Steve Goodier, Life Support Systems, 2013. "Who then is the enemy?" Robert Stuhlmann, Stories from a Priestly Life, 2013. "How Hard Is It Raining," Neil Chappell, aweirdthing, 2013. "Experience First," Christopher Burkett, PreacherRhetorica, 2013. "'A Little Lower Than God,' - Really?" Bruce Maples, 2013. "Exploring Trinity," Andrew Prior, 2013. "Trinity and 'The Shack,'" Debra Dean Murphy, Intersections, 2010. "God as Three Persons?" the Rev. Sam Alexander, Patheos, 2010. A Trinity-Shaped Life, Alyce McKenzie, Patheos, 2010. The Trinity Choir, Melissa Bane Sevier, Contemplative Viewfinder, 2010. One plus One plus One is ONE, Peter Woods, I Am Listening, 2010. "A Good Mystery," Scott Gunn, Sermons that Work, Episcopal Digital Network, 2016. "Suffering to Hope," Charles, Fischer, III, Day 1, 2016. "When Religion Makes Things Worse," by Jim Somerville. A Sermon for Every Sunday. Video sermons from America's best preachers for every Sunday of the Liturgical Year. Domingo de Trinidad, Shannon Kelly, 2016. "What Kind of Math Is This?" Dean Wolfe, Day 1, 2013. "Hope," sermon discussion from Frederick Buechner, Frederick Buechner Blog. "The Modern Mantra," the Rev. Rob Gieselmann, Sermons that Work, Episcopal Digital Network, 2013. Domingo de la Trinidad (C) por el Rvdo. C. Jesus Reyes, Sermones que Iluminan, 2013. "Blessed Assurances," the Rev. William Flippin, Jr., Day 1, 2011. "The Dance," the Rev. Canon Charles K. Robertson, Day 1, 2010. 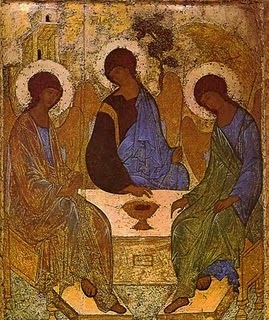 "God in Three Persons, Blessed Trinity," Rev. Garth Wehrfritz-Hanson, Dim Lamp, 2010. "Dancing with the Trinity," the Rev. Dr. Kim Buchanan, Day 1, 2007. Trinity, Pastor Edward F. Markquart, Grace Lutheran Church, Seattle, Washington. "Wisdom Calls," Weekly Seeds, UCC, 2016. BIble Study, Sermons that Work, Episcopal Digital Network, 2016. Estudio Bíblico Domingo de la Trinidad (C) 22 de mayo del 2016. Much to Say, Faith Element, 2016. Podcast. "Access to God," Faith Element, 2013. Bible Study, Trinity, 2013, Colin Mathewson, Sewanee, Sermons that Work, Episcopal Digital Network. "Our Worst, God's Best," faithelement, various mulitimedia approaches to this week's scripture texts. Mustard Seeds, "You ARE Worth It!" Trinity, 2016. A lectionary-based ideas resource for leaders of contemporary worship, Ann Scull, Gippsland, Australia. LCA Worship Planning Page, Trinity, "Everything lay-readers need to prepare worship." Lectionary Liturgies, Trinity Sunday, 2015, Thom M. Shuman, Presbyterian Church (U.S.A.). Liturgy for Holy Trinity (with Blessing of Travelers), Rev. Thomas L. Weitzel, Evangelical Lutheran Church in America. Lector's Notes, Trinity, Gregory Warnusz, Saint Jerome Parish, Bellefontaine Neighbors, MO. Notes and commentary for those reading this week's lectionary texts to the congregation. "Liturgy: prayer reflection", reflections on the collect at the Eucharist, Rev. Bosco Peters, New Zealand. Reflections for the week following Trinity Sunday. The Timeless Psalms: Psalm 8, Joan Stott, prayers and meditations based on lectionary Psalms, 2016. "Our Experience of the Trinity," Dan Schifeling, worshipcalls, 2013. Trinity Sunday Prayer, Martha Spong, Reflectionary, 2013. HermanoLeón Clipart, Trinity. Free clipart, backgrounds, slides, etc. Clip Art, Trinity, Fr. Richard Lonsdale, Resources for Catholic Educators. Clip Art Images: Trinity C, Misioneros Del Sagrado Corazón en el Perú. More about the Spirit of Truth, audio telling, story in episodes, graphic, audio and written commentaries. Go Tell Communications, Biblical Storytelling for the Global Village, 2010. "Make Your Own Snow," video, John Stevens, Dollar Store Children's Sermons, 2013. We Join In Proclaiming , Text: Carolyn Winfrey Gillette. This hymn celebrates the Trinity. Tune: ASH GROVE 6.6.11.6.6.11 D ("Let All Things Now Living"). "A Grand and Gracious Feast," hymn by Paul Janssen. .pdf file of words & music. Please contact the author for permission for use through the church website: Pascack Reformed Church, Park Ridge, New Jersey. "O God, the Great, Wide Seas are Yours" Carolyn Winfrey Gillette. Psalm 8 set to Ar Hyd Y Nos (84 84 88 84) by Dale A. Schoening, Metrical Psalms. Hymn and Song Suggestions, Trinity, 2016, annotated suggestions from Natalie Sims, Singing from the Lectionary. The Billabong, Trinity, by Rev Jeff Shrowder, Uniting Church in Australia: Hymn suggestions and paraphrases of lectionary Psalms. Worship Resource Manual, The Moravian Church, Southern Province. Worksheets for planning music in worship: hymns, anthems, solos, organ repertoire suggestions for RCL texts. Direct link to Trinity Sunday. Choral Anthem Project, Trinity C, National Association of Pastoral Musicians. Sing for Joy, Trinity, 2007. Choral reflections on this week's lectionary readings, St. Olaf College. Together to Celebrate, Trinity, 2016, David MacGregor, Uniting Church in Australia. Contemporary Christian Music resources. "God Is So Big..." On the Chancel Steps, children's resources by Frances Woodruff, 2013. Children's Sermon, Trinity C, Faith Formation Journeys, 2013. Story for Children's Worship and Family Activity, Trinity, at word-sunday.com: A Catholic Resource for the Lectionary by Larry Broding. Lectionary Puzzles, Trinity. Word search puzzles in RTF or plain text, by Reg McMillan, St.Stephen's Presbyterian Church, Peterborough, Ontario.